The ground absorbs nearly half of the solar energy our planet receives. As a result, the earth remains at a constant, moderate temperature just below its surface all year round. However, air temperature varies greatly from summer to winter, making air source (traditional) heating and cooling least efficient when you need it the most. Geothermal heating and cooling systems take advantage of the stable temperature underground using a piping system, commonly referred to as a “loop.” Water circulates in the loop to exchange heat between your home, the ground source heat pump, and the earth, providing geothermal heating, cooling, and hot water at remarkably high efficiency. Geothermal heating and cooling systems qualify for a recently implemented federal tax credit allowing homeowners to deduct 30% of the total geothermal system installed cost from their tax liability or tax due. The Residential Energy Efficient Property Tax Credits program is part of the American Recovery and Reinvestment Act of 2009. This nonrefundable federal residential energy credit helps homeowners pay for qualified residential alternative energy equipment, such as geothermal heat pumps. 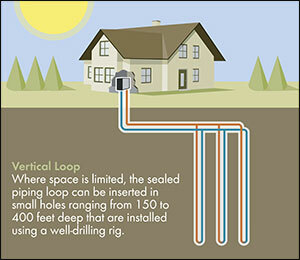 Interested in how geothermal energy can work in your home? Contact Anderson Well Drilling Today. Geothermal, the most efficient heating and cooling system. Have you had your well water system inspected? Copyright 2015 Anderson Well Drilling LLC.